This is Leila Silveira reporting from El Chalten. Today we woke up at Los Notros, and after breakfast we headed out to El Calafate to pick up some paint for George and some more maps of the area. 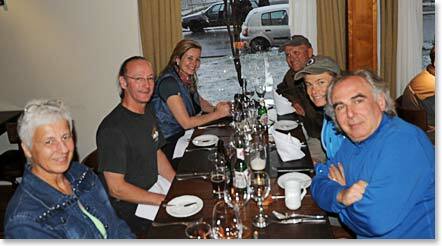 It was a 1 ½ hour drive to El Calafate where we had lunch before continuing on to El Chalten. The distance to El Chalten is only 230 kilometres, but in this area we need to plan a lot of time for driving because the weather is really unpredictable: if the wind starts blowing hard, we need to slow down which makes it a longer drive to reach our destination. 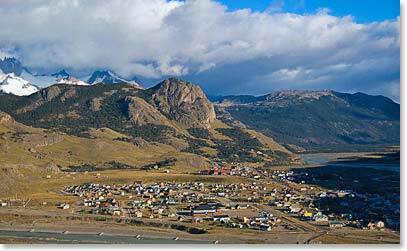 El Chaltén is a small village that was founded in 1985, making it the youngest town in Argentina. Today's population is about 350 during the off season and 600 in the summer. The town has a quite fascinating origin: Argentina and Chile have been fighting for the area since the 1800’s, and only in 1994 was the dispute solved when an international jury judged in favour of Argentina. El Chalten is also known as the “Trekking Capital of Argentina”. During the summer, the town comes alive when climbers, trekkers and tourists from around the world arrive to see the famous Fitz Roy. Due to harsh weather, it is never a sure thing to see Fitz Roy as clouds seem to always be covering the peak. 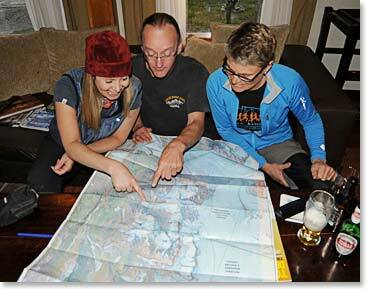 Our goal here is to hike to “Laguna de los Tres”, where, weather permitting, we would have the best view of Fitz Roy. It is a long hike, 700 meters elevation gain over 22 kilometres. We are hoping that the weather will improve (it is snowing right now!) and maybe tomorrow we will be blessed with a clear view of one of the most spectacular mountain spires in the world.